As the world gets flatter and competition in the job market goes global, education researchers like Bill Schmidt have looked abroad to see what other countries are doing better than us. One key difference stands out: national standards. 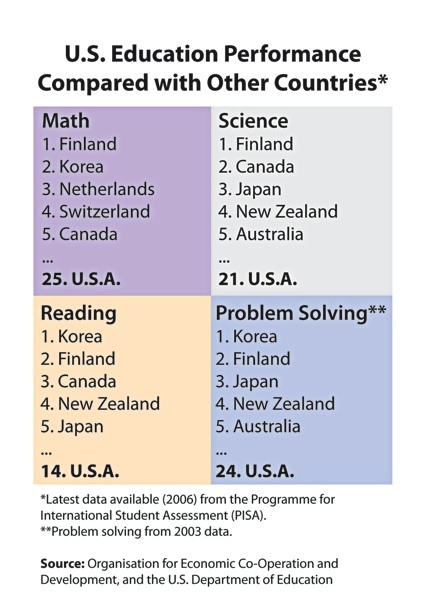 Schmidt added that no definitive study has found all the reasons why some countries do better than others. In 2012, Iowa high schools must follow national standards in math and language arts, and statewide standards in science and social studies. Elementary and middle schools must follow suit by 2014. Iowa teachers and administrators expect national standards in science and social studies to be developed in the next few years. The move is a dramatic change for Iowa, which—until next year—is the last state in the union that has local school districts set standards for their students. Yet top education officials believe the new standards will benefit Iowa students. “Good enough for Iowa isn’t good enough anymore,” Jo Ellen Latham, director of instruction for the Des Moines Independent School District, said. “We’re preparing Iowa students for a global job market,” Kevin Fangman, administrator for pre-K-12 education for the Iowa Department of Education, said. Teams from the National Governors Association used recent research, input from teachers and state education officials and examples from other countries—mostly Finland—to create the new national standards, known as the Common Core. The standards are rigorous and written as clearly as possible for the benefit of teachers and students, said Schmidt, who contributed research to the creation of new math standards. Not only do the standards focus on what should be taught, but on how. Before, students would focus on a subject—say multiplication—for six weeks in third grade, then four weeks in fourth grade and two in fifth. Now, teachers will teach a greater number of different subjects at each grade level. The goal of this new method is to help students master skills like multiplication in one year so they can spend more time building on those skills and less time reviewing them in later years, says Norman Webb, professor emeritus at the University of Wisconsin School of Education. Yet Texas and Alaska have statewide standards for education, meaning that from Barrow to Juneau or from El Paso to Corpus Christi, every student in Alaska and Texas is learning the same set of skills. For Schmidt, that’s the foundational benefit of uniform standards. State and local control in education is a part of Americana. The Constitution has no amendment regarding education—the founders left it up to the states, which had schools operating locally since the mid 17th century. During Manifest Destiny, frontier towns in places like Iowa used their local schools as a way to attract new settlers, said Peter Hlebowitsh, professor of teaching and learning at the University of Iowa College of Education. Inequality among districts and states has only recently become an issue, Hlebowitsh said. Minnesota moved toward statewide standards in the early 90s, but the standards did not become specific and clear until 2003, said Beth Aune, director of academic standards for the Minnesota Department of Education. Aune says the benefit of state standards is evident in ACT scores. Last year Minnesota students led the nation with an average of 22.9 out of 36—two points higher than the national average. 2010 was the state’s fifth year in a row of score increases, which come despite a growth in test takers, something that usually drives scores down, Aune said. Still, Aune noted that Minnesota has one of the nation’s worst achievement gaps. Common standards will help close that gap, Aune said, but they will have to come with more resources for underachieving schools and better teacher preparation. Schmidt also points out that standards are only as good as the teachers who teach them. The debate is still open on how to train good teachers. Aune says professional development sessions and increased communication among teachers is key to good teaching. Others, such as Iowa Department of Education director Jason Glass and GOP presidential candidate Tim Pawlenty, say performance pay is the answer. However Iowa moves forward, Bill Schmidt believes the new standards are the necessary first step. President Obama’s new Race to the Top achievement standards for education aim to even the playing field for students, but are causing challenges for teachers who must cover more material then they are used to. If Iowa plans on participating in the next round of Race to the Top they must move quickly to meet the state and national standards.